Yesterday was Melbourne Cup Day - the biggest horse race of the year in Australasia, like the Grand National in the UK (except that it's a flat race) in that everything stops when the gates open at 5pm our time. There are sweepstakes organised in workplaces everywhere and though the ones I've taken part in have always been in schools and consequently modest $5 affairs, in some companies it's a prize really worth winning. NZ horses are always running, and have often won, so we have a particular interest, but mainly it's an excuse for a bit of fun. On this day last year I was working on a hideous story assignment on shopping in Auckland (I'm not a shopper) in pretty Parnell where in amongst the boutiques and galleries there are many restaurants and bars where young women in hats and high heels were entering into the spirit of the day - spirits were a big part of the celebrations, judging by the hooting and shrieking spilling out over the verandahs. The year before that I was in Cairns, about to go on a safari to the northernmost tip of Australia, Cape York, where the crocodiles are huge and there's no swimming in the warm turquoise waters. The race was run while I was on the plane, but the captain announced the winner, and by the time I was walking around the town, much celebrating had already taken place, the hats were lopsided and it wasn't just the heels that had the women tottering. It's a public holiday in Melbourne, but a good number of shops in Cairns had 'Closed for the Cup' signs on the doors. I went to watch the sunset down by the beach, where there's no swimming either because of crocs (and jellyfish) but there is lovely landscaped swimming pool just beside the sea. 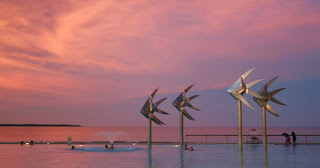 As dusk fell thousands of fruit bats streamed overhead from beyond the town, past the shops and hotels, right above the Esplanade lagoon and out across the bay to a distant headland where the mangoes were ripe. It was an astonishing sight.